Got a bit more done yesterday on the A7. 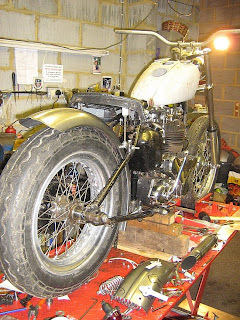 Had some rear mudguard mounts made up, and went 'round my mates to form them to the profile of the mudguard. Went better than I expected, I took the mudguard offcut and drilled a hole to accept the top bolt, and fixed the new flat bracket to it. 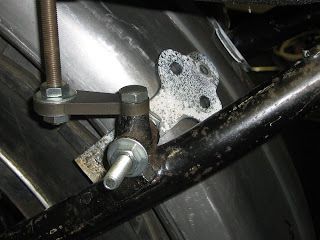 Applied some heat, starting at the other pair of holes and tapped it down, then whilst bringing the heat slowly down the length dressed the rest around the mudguard until it laid flat against the surface. I'm really chuffed with the result, you know how it is, there's a vision of the idea in your mind's eye of how you want it to look, and when the real thing looks the same it's great! You can see the brackets, pre gas axe attack, on the bottom right of this picture. The mudguard will run a little lower than seen in this shot though. It's not going to be possible to fit it really tight to the tyre as it's intrinsic radius is slightly too large. Although visually that's not too bad as bringing it up higher tends to make it look part of the whole package, and not floating out the back in isolation. The mudguard itself is really strong with rolled and wired edges, I am sure it isn't going to need any more support at the rear. Nice. This is just a by the way shot of the rider's eye view. Don't foresee much else goig up here so it should look pretty clean. 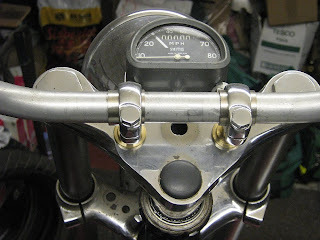 The forks are Commando with the top yoke shaved down to remove the original handlebar clamps. Current thinking is, that the yokes will be black in the final reckoning. Funny how what we chromed 30 years ago is now being stripped and done in Henry Ford's favourite shade. Great Blog mate... some interesting stuff..